The remote location, depths, and varied topography of the Cordell Bank National Marine Sanctuary make it necessary for researchers to use a variety of vessels, tools, and technology to research, explore, monitor and manage the sanctuary. Some of the vessels and tools that scientists use most often to study Cordell Bank National Marine Sanctuary are listed on this page. The Office of National Marine Sanctuaries' 67-foot R/V Fulmar is used for research, education and emergency response programs for the west coast region. The vessel is homeported at the Monterey Harbor in the Monterey Bay National Marine Sanctuary, and serves the Monterey Bay, Greater Farallones, and Cordell Bank national marine sanctuaries. Remotely operated vehicles (ROVs) are underwater robots that are tethered to a vessel, driven by a pilot on the ship, and used to collect imagery, physical samples, or take measurements. 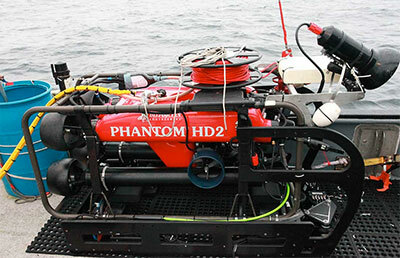 Cordell Bank National Marine Sanctuary owns a small Phantom HD2 ROV with a working depth rating of 300m. The ROV is equipped with an optical zoom high-resolution video color camera with 90 degree tilt, high power lights, a three-finger manipulator arm, and paired lasers for sizing objects in the video camera's field of view. The ROV is a valuable tool in collecting data and images from the seafloor of the sanctuary that is otherwise difficult to access. The CBNMS ROV has been used in surveys of the seafloor in CBNMS, GFNMS, and MBNMS. The Cordell Bank National Marine Sanctuary towed camera sled is similar in design to the ROV except it is towed behind the ship rather than driven by a pilot. The camera sled also has high power lights, an optical zoom video color camera, and paired lasers for sizing objects in the video camera's field of view. The sled is considerably less maneuverable than an ROV, and therefore, its use is generally restricted to low relief habitats to minimize collisions and encounters with entanglement hazards. CBNMS has used this tool to survey the soft sediment habitats on the continental shelf.